How Many Calories Are You Really Consuming Mid-Flight? HomeGamma ChatHow Many Calories Are You Really Consuming Mid-Flight? Plane food…it doesn’t look very appealing and it rarely tastes any better. It’s usually either too mushy, too dry or seemingly impossible to cut with the plastic cutlery provided. Now, just when you thought plane food couldn’t get any worse, research proves otherwise. According to Oxford University Professor Charles Spence, who wrote, Gastrophysics: The New Science of Eating, the average passenger consumes 3400 calories between take-off and landing. Professor Spence says that our sense of taste is significantly diminished at a high altitude, where engine sounds and other background noises suppress our ability to taste sweet and salty flavours. As a result, airline meals contain about 15 to 20 per cent more sugar to the foods we eat on the ground. While adding additional sugar and salt to meals is one method used to make food taste more appealing, another tactic used by airlines has been to enlist the services of celebrity chefs. Professor Spence says there is no evidence to support the claim that celebrity chef interventions have led to increased passenger satisfaction. Gordon Ramsay seems to agree, in an interview with Refinery 29, Ramsay revealed his serious distaste for airplane food. While the added salt and sugar in airline meals contribute to the excessive calorie count, Spence says that people tend to eat more on flights due to boredom and stress. 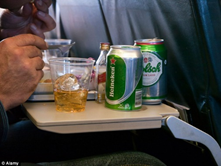 Even the in-flight entertainment can affect our consumption, by distracting us from our full stomachs. According to Spence, It is not uncommon to find people eating as much a third more food with the TV on. 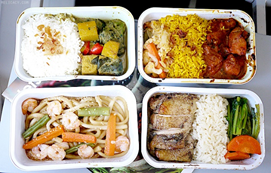 Unfortunately for passengers travelling on a long haul flight, there aren’t many options other than to eat the calorie-rich meals the airline has prepared. Despite this, there are many other ways in which you can stay healthy on a flight. Most people should be drinking the equivalent of a litre of water during a six to eight hour flight in order to remain well hydrated. Despite this, most people drink less water during a flight than they would on the ground. Dehydration can cause headaches, fatigue, constipation and can even make you sick. That’s because lack of humidity in the pressurized cabin dries out mucous membranes, making it harder for your system to flush out germs. Unfortunately, as airlines cram more people onto aircrafts, the chances of a reliable, frequent beverage service isn’t high if you’re flying economy. However, staying hydrated before and during your flight is the best way to protect yourself from germs and illness. While you can purchase an overpriced bottle of water after you’ve cleared security, the most cost-effective way to stay hydrated in-flight is to bring an empty water bottle through security. Once you’re through, fill the bottle up at a water fountain and drink up before, and during your flight. While the airport lounge looks like a comfortable spot to stop off for a drink before your flight, you have a much greater chance of staying healthy if you avoid drinking alcohol before or during your flight. Alcohol is extremely dehydrating, so drinking prior to or on a flight, combined with the low cabin humidity, lowers your resistance to cold and flu germs. Heavy drinking also suppresses the immune system. In fact, recent studies have shown that people who drink several alcoholic drinks a day are more susceptible to infections and illness. No matter where you’re travelling, hand sanitiser is definitely a travel essential which should be used as soon as you step foot on the plane. According to research conducted by Travelmath, the dirtiest part of a plane is not the toilet, but right in front of your seat! 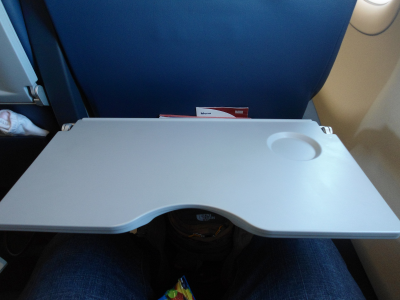 An evaluation of germs per square inch on different surfaces in airports and on planes found that the average tray table harbours nearly 20 times more bacteria than the aircraft toilet flush. In addition to washing your hands after going to the bathroom and before eating, hand sanitizers should be used before you tuck into your mid-flight snacks. Studies show that lack of humidity in the enclosed space of the airplane cabin is one of the primary reasons why people are more likely to get sick while flying. When your eyes are dry, it’s more tempting to rub them, but touching your eyes means you could be transmitting cold and flu viruses. If you have germs on your hands, they can travel through the tear ducts to the nasopharynx at the back of the throat, where cold viruses do their damage. In addition to using hand sanitiser, wash your hands frequently and thoroughly and avoid touching your eyes. If you wear contact lenses, remove them before boarding and wear your glasses on the plane. Never let yourself fall asleep with your lenses in, as your eyes will become even drier. Air pressure changes during flight, particularly during take-off and landing where when the Eustachian tubes that drain the ears fail to regulate the pressure on the eardrum. Some people are more prone to the problem than others, and having a cold or being a little bit congested can increase your likelihood of experiencing ear pain. Activating the muscles in your jaw helps open up the Eustachian tubes, so chewing on a lolly or a piece of gum is recommended during take-off and landing. 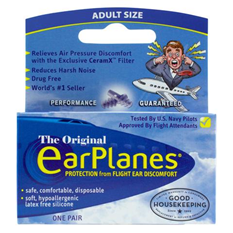 If you have this problem frequently, purchase a pair earplugs designed specifically for air travel. Earplugs such as Earplanes work to gradually equalize the pressure on your eardrums, and can be purchased at most pharmacies and chemists. While plane food is usually unavoidable on long haul flights, looking after yourself before and during your flight can ensure you get to your destination feeling healthy and refreshed.